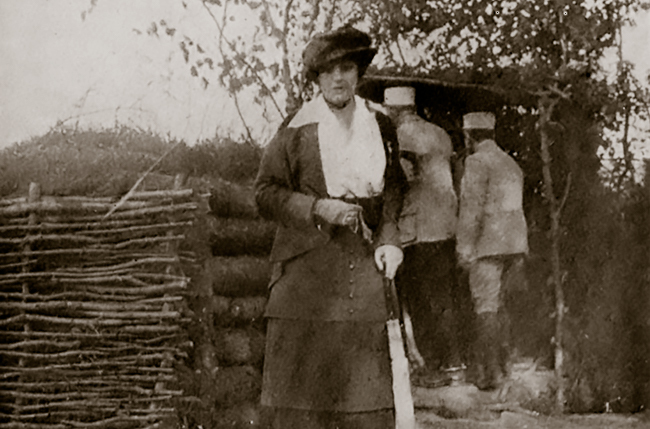 “A French Palisade” [Edith Wharton at the front]. Frontispiece from Wharton’s collection of journalism, Fighting France, from Dunkerque to Belfort (1915). In the midst of this activity, Wharton found the time to make five visits to the front in the Argonne and at Verdun, travel through the frontline trenches in the Vosges, and tour hospitals to investigate the need for blankets and clothing. She was so busy during the first two years of World War I that she composed virtually nothing in the way of fiction. In June 1915 she wrote to her publisher, Charles Scribner, in near despair about her publication schedule. She had “thought the war would be over by August,” but as things stood she would be unable to deliver her long-promised next novel. (Tentatively called “Literature,” it was never finished.) She instead proposed a different book: “I have been given such unexpected opportunities for seeing things at the front that you might perhaps care to collect the articles (I suppose there will be five) in a small volume to be published in the autumn.” Her journalistic essays were thus published later that year, both in Scribner’s Magazine and as a book, Fighting France, from Dunkerque to Belfort. She also edited The Book of the Homeless, an anthology to benefit relief efforts that was published in January 1916. The volume featured introductions by French Marshal Joseph Joffre and Theodore Roosevelt and included poetry, essays, art, fiction, and musical scores by an incredible list of cultural celebrities, including Jean Cocteau, Joseph Conrad, Thomas Hardy, William Dean Howells, George Santayana, W. B. Yeats, Sarah Bernhardt, Henry James, Max Beerbohm, Claude Monet, Pierre-Auguste Renoir, and Igor Stravinsky. (Wharton translated the non-English works herself.) The proceeds from the volume and related materials, while less than she had hoped, totaled well over $10,000. In the spring, in appreciation of her activities for the war effort, the French government made her Chevalier of the Legion of Honor. She was made Chevalier of the Order of Leopold by King Albert of Belgium in 1919. Notes: On page 248, Wharton refers to a wounded V. C., a combatant who has received the Victoria Cross, the highest British military decoration for valor. Mélisande lowering her braid over the balcony (p. 253) is a reference to a scene from Claude Debussy’s 1902 opera, Pelléas et Mélisande. Miss Ivy Spang of Cornwall-on-Hudson had published a little volume of verse before the war. . . . If you don't see the full selection below, click here (PDF) or click here (Google Docs) to read it—free!